Welcome #FIRST NAME# to the ON24 Webcast Elite Certification Content Gateway! 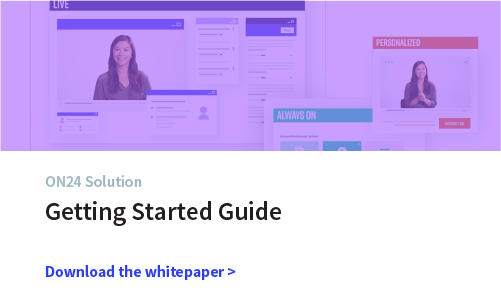 The Getting Started Series is currently available to help you quickly start utilizing ON24 for your webinar programs. 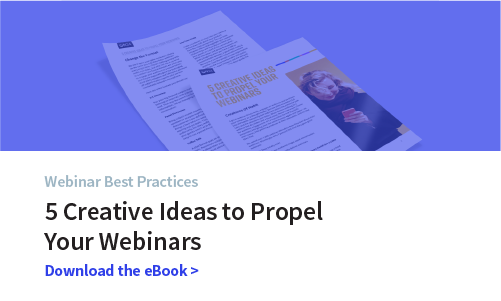 Learn all the tools you need to deliver data-driven, engaging webinars to help you achieve your goals. Take all ten webcasts and the final exam and become ON24 Certified! Session #1: See how to leverage your My Webcasts page, the home page for your webinar-based marketing solution. You will discover how to search and sort thru all your existing webcasts, access the Webcast URLs for each, create a copy of a webcast and delete webcasts. 11 minutes. Session #2: Learn how to begin the process of creating a webcast, including building your Overview page, understanding the basic dial-in present type, setting your start time, duration and language and the useful information that the Overview page provides to run and deliver your webcast. 12 minutes. Session #3: Discover how to build your registration form and page that will capture all of the information you need plus plan branding and alignment with your other promotional materials. You will learn how the registration process works, the fields available to be used and ways to add custom fields, the different options for registration and how to design and brand your registration and lobby page. 20 minutes. Session #4: Learn the purpose of email notifications, the different types of email notifications that are available, how to activate and edit them and the importance of the confirmation email and Calendar reminder specifically. 12 minutes. 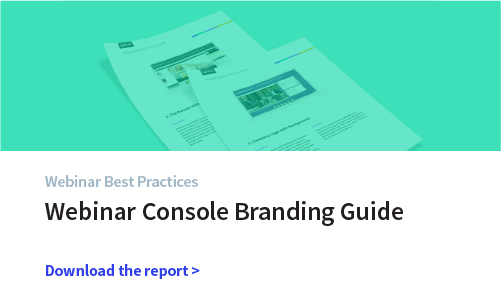 Session #5: See how to create a basic but engaging webinar console that conveys your brand and the overall message of your webinar. You will learn how to use the Console Builder, including styling your console background, adding images to the console, adding and configuring the basic widgets and leveraging the sizing and alignment tools to position widgets on the console. 12 minutes. Session #6: Learn the significance of PowerPoint slides for a webinar and the basics of slide design including how to make slides visually interesting, how to use powerful images to convey your message and how to best use text. Within the Slides and Video Clips page and Presentation Manager XD, you will see how to upload and update your slide deck. Also we will discuss how to build a slide deck that is most suitable for a webinar. 12 minutes. Session #7: Learn how and when to use video clips in your webcasts, what the specs and accepted file formats are, how to upload video clips from both the Slides and Video Clips page and within Presentation Manager XD, configuring your video clip for display and best practices for sharing video clips during a live event. 10 minutes. Session #8: Learn the value of polls in engaging your audience and hearing their voice. You will see how to add polls using Presentation Manager XD, understand the different types of polls available, and the different display options. We will also discuss how to organize polls in your presentation, best practices for sharing polls during a live event including previewing the responses using Preview Window. 12 minutes. Session #10: See the variety of ways available that our customers can be fully trained and supported on the Elite platform, including the Elite Help Center, Daily Training Sessions, Scheduled Custom Training Sessions, Live Support Chat, Technical Support from Platform Support and Phone Support via the Live Event Emergency Line. 13 minutes. Session #11: The final exam and last step for your ON24 Getting Started Certification to become ON24 certified and a recognized expert in using the industry leading webinar-based data-driven marketing solution. 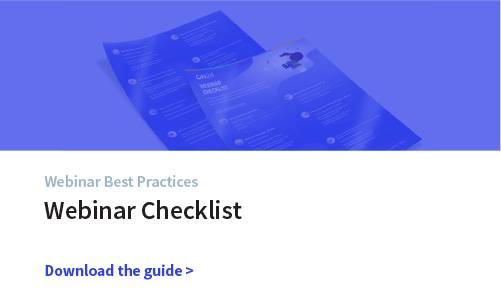 Session #1: In this webinar we will explore five easy ways to create an engaging and effective registration page and make it more likely visitors will register and attend your webinar. 17 minutes. Session #2: Polling is a popular tool to drive audience interaction and is used in 27 percent of all webinars. This session will focus on how to use and configure poll questions to gather data and increase engagement. We'll also review best practices and different strategies for sharing poll results with a live audience. Finally, we will discuss how using polls impacts the engagement score. 17 minutes. Session #3: The most popular tool to drive audience interaction is the Q&A widget, used in 82 percent of all webinars. In this session we will review the basics of managing Q&A effectively, including the power of using seed questions and best practices. Finally, we will see how using this widget can help increase engagement and impact the attendee engagement score. 11 minutes. Session #4: In this webinar we will discuss two easy and simple ways to incorporate video into your webinars and engage your attendees, use of video clips and presenting by webcam. You will also see the general benefits of using video in webinars, learn quick tips for effectively presenting by webcam and situations where video clips can add variety and engagement to your webinar conversation. 6 minutes. Session #5: Surveys are the 3rd most popular tool to drive audience interaction in ON24 webinars. In this webinar we will examine the utility of surveys for engagement in an ON24 webinar, some goals surveys can help accomplish and look closely at the how to create and deploy a survey, including adding questions and best practices. Finally, we will see how using this widget can help increase engagement and impact the attendee engagement score. 13 minutes. Session #6: The Resource List widget is the second most used ON24 widget. In this session, you will learn how the resource list can provide attendees with additional, in-depth content, including of download complementary webcast content and reference material for later review. You will also see how ON24's Webcast Intelligence Report tracks audience interactions with your resources to help you measure engagement and identify your best leads. 10 minutes. Session #7: Social media can be a valuable tool in the delivery of your webinars. As your social footprint grows, so does your ability to create a more engaging virtual experience and extend the reach of your content. In this webinar we'll review practical social media methods to extend your content's reach and increase audience engagement and you will discover how using social media can provide an outlet for dialogue about your webcast content. 10 minutes. Session #8: In this webinar we will explain the significance of online community during a webinar and discuss how to leverage, configure and deploy two widgets known for collaboration, the Group Chat and Idea widgets. We will also describe the implications for settings in how these tools are used and the impact to the engagement score. 12 minutes. Session #9: In this webinar we will describe the general types of data that webinars provide after the event is completed, and how to access event level and program level reporting in the ON24 platform. We will also look at how to access several key data points and views, and determine what they mean for your individual leads, the individual webinar and your webinar program. 15 minutes. Session #10: The final exam and last step for your ON24 Engagement & Interactivity Certification to become ON24 certified and a recognized expert in using the industry leading webinar-based data-driven marketing solution.